Home health train worldhealthinfo SHE WOKE UP ALONE ON A TRAIN STATION BENCH, BUT FOUND A NOTE CLENCHED IN HER HAND THAT REVEALED AMAZING LOVE. 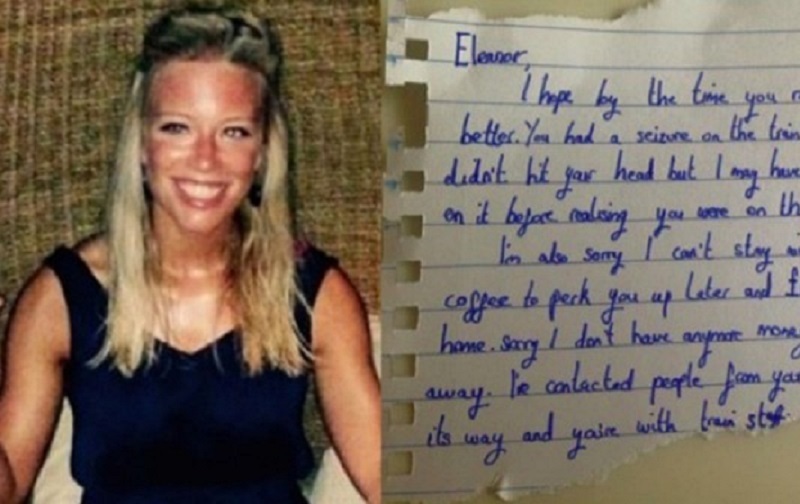 SHE WOKE UP ALONE ON A TRAIN STATION BENCH, BUT FOUND A NOTE CLENCHED IN HER HAND THAT REVEALED AMAZING LOVE. Imagine waking up, not knowing how you got somewhere, how long you’d been there or what had happened. That’s exactly what occurred with 27-year-old Ellie Farnfield. One moment she was riding the train and the next thing she knew she was lying on a bench in the station. Ellie had suffered from what is called an unprovoked seizure, something totally unexpected for the victim–it can be terrifying and create tons of anxiety. But something she found clenched in her palm when she regained consciousness gave her a sense of comfort. Now, Ellie is turning to social media to find Tom. She wants to thank the stranger who treated her like a dear friend. Because of the overwhelming amount of positive response, the odds of reuniting with Tom are turning in Ellie’s favor!